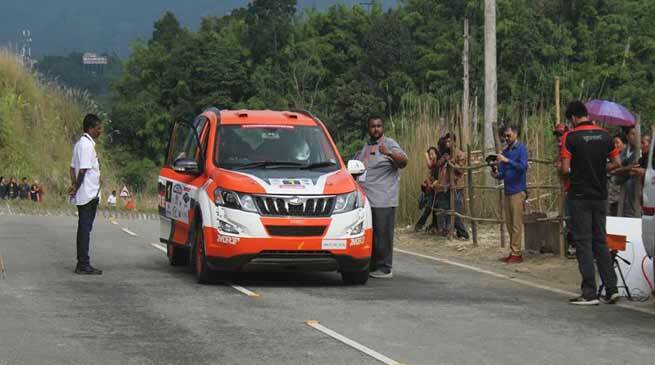 Gaurav Gill emerged victorious at the opening day of Rally of Arunachal from Chimpu to Hollongi near Itanagar. Team Mahindra Adventure’s Gaurav Gill emerged victorious at the opening day of the MRF-FMSCI Indian National Rally Championship (INRC), Round 3 that took place in Itanagar, Arunachal Pradesh today. Defending champion Gaurav Gill asserted his supremacy to take a lead on day one of the Rally of Arunachal. Competing in the first tarmac rally of the year, Gill carries the favourite tag post his opening two rounds of the season wins in Chennai and Coimbatore. The ace rallyist along with Musa Sherif as co-driver completed the total four stages of the total distance for an aggregate timing of 31:22.9 minutes and stayed ahead of the pack. The three-time APRC champion and his co-driver Musa Sherif were in a class of their own, winning three of the four stages on Saturday much to the delight of awe-struck fans. Gill driving Super XUV500 lost 5 seconds because of a tyre burst. INRC-2 competitors, Snap Racing’s Phalguna Urs and Srikanth, driving the Volkswagen Polo, were the surprise factor of the day, who took the second position with an impressive timing of 32:54.7. They showed a lot of speed and power in the first three stages but faltered in the fourth stage to hold on to second position overnight. Gill’s teammate Amittrajit Ghosh with Ashwin Naik as co-driver clocked an aggregate timing of 33:05.1 to finish third in the day one of the competition. Both the INRC-1 competitors will be looking to improve their standing on the second day of the competition tomorrow. Earlier, in the day the rally was flagged off by DGP, SBK Singh, who is behind the concept of Tourist Police and Tourist Police app for Arunachal Pradesh. Top motorsports competitors from across the country are participating in the rally that is being hosted by the Motorsports Club of Arunachal, which has been affiliated to the Federation of Motorsports Clubs Of India (FMSCI)– the apex governing body of motorsports in the country. The rally features three teams from Nagaland and one from Arunachal Pradesh. The motor sport competition is taking place at National Highway 425 from Chimpu to Hollongi near Itanagar.